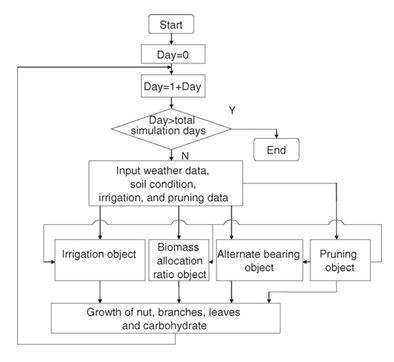 A modeling approach to understanding the physiological response of a nut tree to inputs of water, nutrients, salinity, cultivation, and pruning offers the only way to understand the complex interaction of these management decisions on nut production. Models joined with experiments are an excellent way to synthesize what we learn in experiments and then to estimate the best management strategies. Experiments alone are insufficient and inefficient. For example, robust experiments to induce tree responses to water stress use many replicate trees, which entails a risk of long-lasting damage or death. However, any tree model must be verified by controlled field experiments under different environmental conditions. Simulation models are used to understand the integration of physiological processes and mechanisms of tree response to stress. Models are used to interpret experimental results gained under different environmental conditions and to develop and test new production technologies. Tree growth models typically integrate four main carbon processes: photosynthesis, respiration, reserve dynamics, and carbon allocation. Furthermore, we need to cover a wide range of climates, variations in weather, soil types, etc. Consequently, limited experiments to parameterize a functional model are needed. After model verification, optimal management decision can be derived by the model and implemented using rules for its use by the end user. The future of nut tree models will be the development of realistic modules that can be linked together quickly to build a nut tree model appropriate for the management options available to growers. If a tree growth model is built as a user-friendly decision support system, it should include all objects necessary to simulate crop growth. One programming approach is to develop object-oriented decision support models that contain real-world objects with software counterparts. Objects interact with each other and with their environment. The advantage of structuring a nut tree model in an object-oriented decision support system is that objects can be added, removed, or changed depending on the model developer’s needs. 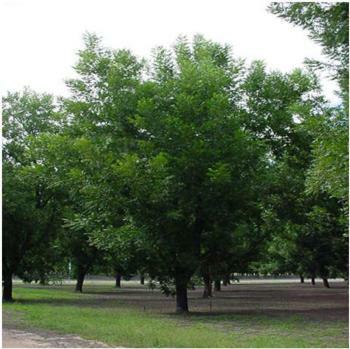 The goal of the current project is to develop and validate an improved management model to monitor and predict nutrient demand and nutrient status in pecan trees along with the interaction of nutrient and water stress on nut yield.